If you are looking to open a restaurant, one of the first things you need to consider are your fixed costs. Well consider this, rent is $1650/month total rent, fixed for the next four years for this turn key restaurant. The space is approximately 1800 square feet. You will not find a better value than this. They are located near the corner of two very busy streets running through El Cajon, one of the largest cities in San Diego county. The Exterior has a newly remodeled, modern look with great signage on two sides of building. Location also has a very large and impossible to miss monument sign. There is even an unused patio area that could really bring this place to life with just minimal effort and expense. Currently it is a Mexican food restaurant, but the space, kitchen and existing permits allow for just about any concept you could imagine. 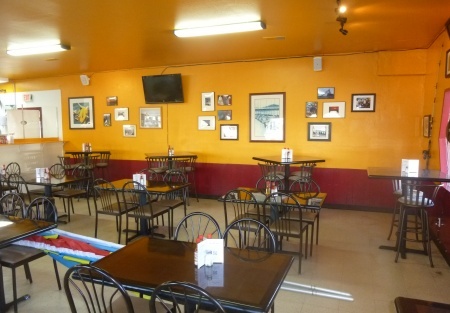 From a hole in the wall taco shop (remember that rent of only 1650) to a full on Mexican Cantina, this place offers the ability to be what ever it is you are looking for. They have a beer and wine license along with a deli permit in place. Mexican food plus a mercado/ tortilla factory ? that is a winning concept just waiting to be developed. How about a middle eastern restaurant and market? The demographics would support either. Put your thinking cap on and design a place that will capitalize on the unbelievably cheap rent and large residential population surrounding the place. It doesn't take much in sales to make money with a rent factor like this. Sellers are currently doing 18-20k per month with no effort on their part. Both owners have full time jobs and are not able to dedicate the time necessary to really make this place successful. Have you dreamed of being your own boss and running a successful restaurant? This is a low risk opportunity for an owner operator to do very well, don't miss the chance to succeed that this place will afford you. There is a full hood system with plenty of equipment to fit your concept. Yes it really is only $1650 for the next four years! !